Razer has made some of the best peripherals for streaming gamers, and now it’s introducing the world’s first webcam with its own built-in lighting: the Razer Kiyo. 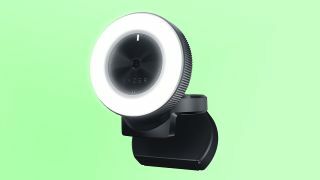 The gaming hardware maker claims the Kiyo is the world’s first desktop camera equipped with an adjustable ring light to provide professional grade lighting without any additional accessories. The ring light offers 12 levels of brightness for a wide range of illumination. Lighting aside, the camera outputs 720p video at 60fps and 1080p footage at 30fps. That’s not nearly as silky smooth as the Stargazer webcam Razer introduced last January, but it’s should be more than enough resolution and frame rate for most streamers publishing videos on YouTube or Twitch. The Razer Kiyo is also compatible with Open Broadcaster Software and XSplit, and will be available later this month for $99 (about £75, AU$126). Razer has also introduced a new Razer Seiren X, a professional-grade microphone complete with a shock mount. With this new attachment, the USB condenser won’t pick up any of sound caused by vibrations due to taps on a table, heavy footsteps or, say, you spiking your mouse after a frustrating loss. The Razer Seiren X is equipped with 25mm condenser capsules and, thanks to a super cardioid pickup pattern, it records sound from a single direction in a tight cone. The Razer Seiren X will also be available later this month for $99 (about £75, AU$126).